Come fill your heart and feed your soul with the magic of community singing at Dancing Rabbit Ecovillage’s first annual Singing Rabbit! Singing has been a backbone of human culture for millenia. Whether used for storytelling or recreation, the magic of song has been an essential means of expression, connection, and celebration. You can take part in this ancient tradition with us. Bring your voice to help weave together a wondrous community through song. 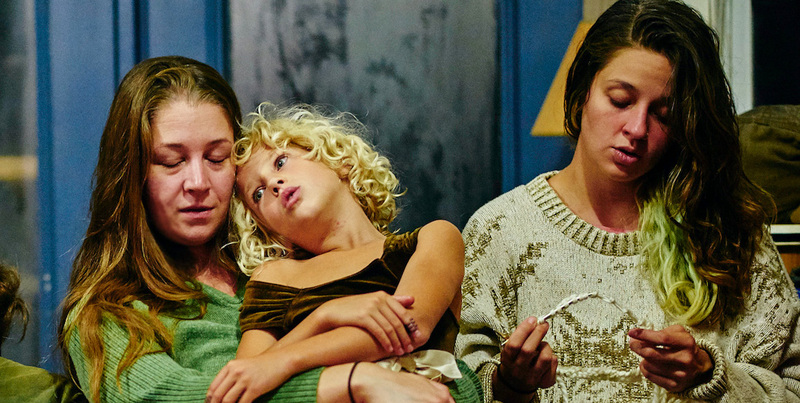 No matter your talent, age, or skill there is a place for you at Singing Rabbit. Come and explore singing together within a thriving ecovillage. Join a community with a strong song culture and a rich background in using song in song circles, important life events, and everyday life. Spend your Labor Day weekend with us, out in nature, surrounded by laughter and music. Singing Rabbit will be an intimate gathering of 80-100 people, including many members from our own village. Come experience the heart of community with song, laughter, good food, and connection. Ready to sign up? Fill out your info below to be taken to the registration form! Gather by the fire with us among the rolling hills of Northeast Missouri, at Dancing Rabbit Ecovillage. You’ll be surrounded by the beauty of nature while enjoying our village life. There will be plenty of time for you to explore and learn about Dancing Rabbit. You’ll have the chance to tour our land and a variety of our green and natural buildings. Come learn how sustainable living isn’t just about respecting the planet, but the connections we make with each other. 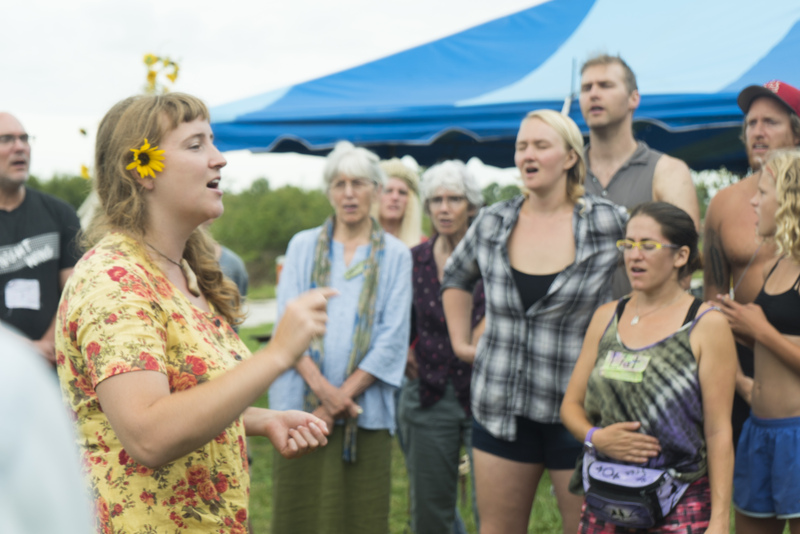 Raise your voice and create a community of song with us here at Dancing Rabbit Ecovillage for our first annual singing event! Arrive on Friday, August 30. Depart Monday afternoon, September 2. Annie Zylstra - Annie Zylstra is a classically trained vocalist who has transitioned to inspiring the world to sing for the joy of it. She loves to share her gift for singing with the world, engaging in song circles from the U.S. to the UK. As a person who lives her life in an offering to song, she brings a magical element to any choir or song group she leads. With a wealth of original songs and a guidance in harmony making, you can feel comfortable to sing along no matter your experience level. Liz Rog - Liz Rog, founder and lead organizer of Village Fire, has a life’s passion of bringing people together simply for the joy of singing. She leads a variety of groups and focuses on gathering people together to reclaim their birthright of joining their voices in song. Liz has faith in improving the world by uniting people through the wondrous feeling of song. No matter your level of experience, you are always welcome to join in and sing. Liat Batshira - Liat Batshira's name (given at birth) means "daughter of song". She has been singing in choirs since before she could read, and has been leading song circles on the East Coast for 7 years. Liat is especially drawn to songs that have simple yet powerful lyrics and she believes that songs can be medicine and help us to heal. We will work together cooperatively to provide 3 meals a day, packed with as much nourishing, local food as possible. We can work with a range of dietary needs – let us know your particulars when you fill out the registration form. Please note that we will do our best to accommodate different dietary needs but cannot guarantee that we will be able to, and you may need to bring supplemental food. The event fee includes camping accommodations, which includes shower and composting toilet access. Some tent platforms will be available. Indoor accommodations may be available to rent during the event for an additional fee. We have several options: rooms in cabins, private homes, and the bed & breakfast. Email us after you register to see what’s still available. The all-inclusive fee covers meals, camping space (bring your own gear), showers, bathrooms, WiFi, and community building access. Indoor accommodations are available at an extra cost. There are limited work trade options available for this event. Please inquire for details.